When someone screws up, we may have just one chance to give them a second chance. “OVER HERE,” waves Erica from a bench. It’s our second picnic lunch since I parted from her firm. Two weeks ago, we rendezvoused in this suburban Virginia park to share recent photos. Then I lent her a camera and a brace of lenses. We’re both passionate for photography. Thanks, Erica. Younger by 18 years, my European friend is blessed with a silky voice. What will the guys at the office think? I’ll have to satisfy them that our tête-à-tête is kosher. I’ll have to take our picture. “I will,” volunteers a cheery soccer mom. “Well, today I could use a boost,” she smiles. “Joan,” she says, extending her hand. As we reach the bench, I introduce Joan to Erica. Then I lower the neckstrap over Joan’s head. “No way you can drop it,” I assure her. Most first-timers have trouble seeing the second, “ghost” image. It’s easy to miss if you’re not sure what you’re looking for. Classic rangefinder cameras like this 1967 Konica are nothing special; I nabbed mine on EBay for 65 bucks. But they’re such quaint affairs that I’m often mistaken for a journalist or a pro. Next week, while escorting my young daughters to a Ninety-Eight Degrees concert, I’ll be told by guards I can’t use a Yashica. 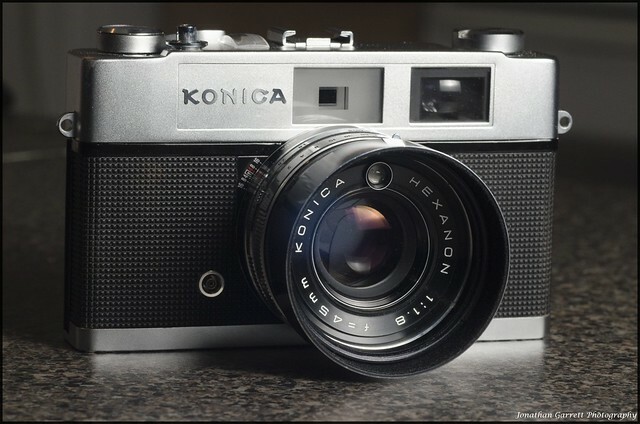 It resembles the Konica. A long pause. “The shutter doesn’t want to press.” Poor Joan. This was supposed to be a piece of cake. “I must have forgotten to advance the film,” I offer. Joan slips the Konica over her head and into my expert hands. The film lever is cocked. What could be the problem? Kneeling, I take aim at Erica and gently press the button. My handheld photo of my coworker Erica, captured on film with my 1967 Konica rangefinder. Click! I trip the shutter. Why couldn’t Joan? I try to flick the film-advance lever, but it won’t budge. Great. That was frame 24—the final frame. Stupid drugstore film. Joan hears, “You blew it; thanks for nothing.” I want to tell her about my Yashica. But Joan, like frame 24, is gone. Convinced, I’m certain, that no good deed goes unpunished. Years ago, I stood in Joan’s moccasins. An ex-girlfriend, Judith, had lent me her single-lens reflex camera—a newfangled autofocus affair that made my Minox 35 seem like a Brownie box camera. To load the film, she explained, just “pull the leader past the red bar; when you close the back, the camera will advance to frame 1.” I’d have a week to master the beast’s lights, beeps, and whirs. A week till I’d be shooting Judith’s wedding. I shot all 24 frames, then learned that the film hadn’t moved; I had pulled the leader too far to catch on the take-up reel. Yet the beast had not whimpered, whined, or groaned in protest. Nor was there a rotating rewind knob to tell my eye that film was—or, as it were, wasn’t—on the move. Nonetheless, my former flame cut me no slack. How, she asked, could anyone have been so stupid? Easily: Lever or no, I’ve made a career of committing photographic blunders. I once shot a wedding reception with an empty camera. (All right, that time, a glance at the rewind knob would have told me so.) Last month, as my daughter Vicki was fitted with an insulin pump, I shot frames 25 through 36 on a 24-exposure roll. Starting today, I'm buying 36 shots per roll. It's pro film or no film. As Erica and I polish off our desserts, the whole Joan affair is not sitting well. From a distant age, I’m haunted by the reproachful voice of Chuck Yeager, the test pilot who broke the sound barrier. Early in one flight, both engines lost oil, and Yeager barely touched down. “Judd,” the flight technician, had neglected to tighten the bolts. Before his next flight, Yeager personally asked Judd to prepare the plane. A second chance, he explained. I buckle my lunch bag, an oversize, weathered camera bag. Then Erica and I stroll to her Bronco. With a “Thanks again,” she hands me back my loaner bag, laden with lenses. But my eyes are scanning the pavilion for Joan. If you know of a pill that would let me, I’ll take two. Click to leave a message below.